Where the heck did I go? With 16 week belly pic! | House Unseen. Life Unscripted. I should be sharing Christmas photos. Like, kids decorating cookies in matching pajamas and stuff like that. But guess what? Ice storms are a fart face. Our power went out at 6:20 a.m. on Sunday. Do you KNOW when it was restored? 2:15 p.m. on THURSDAY. The day after Christmas. For Sunday and Monday and part of Tuesday, we totally kicked it pioneer style, except we don't have an outhouse so our bathroom became an in-house and can I just emphasize for a second the glory of running water? Functioning indoor plumbing? I mean, the no lights, the no heat- you can imagine how one deals with that. But no water? No washing of the anything? No drinking it? No cooking with it? The no flushing of the toilets? It ain't pretty, my friends. Not pretty at all. Luckily on Tuesday afternoon (that's Christmas Eve if you're keeping track), a friend of ours whose power had been restored came over with their generator and hooked it up with Tommy so that we could have some dang old Christmas lights on our dang old tree. And we could flush the dang old toilet. Still no hot water heater or major appliances but my LORD what a relief it was to know we could have some semblance of normalcy come Christmas morning. So! We did! I'm sure I have some photos around here somewhere. But somehow it's 5:18 and people are asking me what's for dinner and I'm like "isn't this vacation time?" See, Tommy is on vacation, so he doesn't have to go to work. To me COOKING is my work. It is my most loathsome household task. So when he is on vacation my brain tells me that I'm also on vacation and then people are hungry. Super unfair. That's my long way of saying that Christmas photos will have to wait. But I promised myself belly pics on even weeks during this pregnancy and by golly I'm doing it. 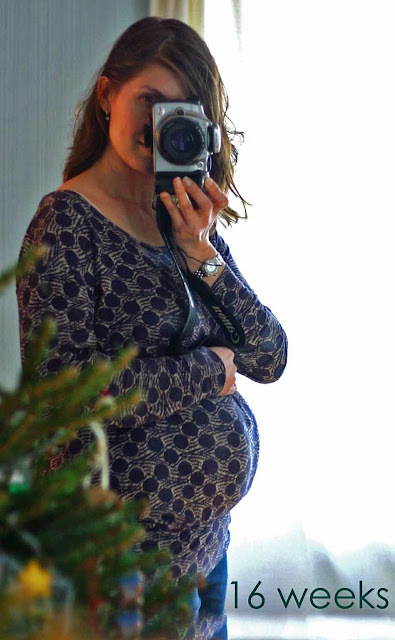 Presenting, unrelated to anything in this post, enormous 16 week belly of enormousness. Feel free to go back two weeks and marvel at the growth. I dare you! DANG I know a handful of other Michiganders that were out of power too - you would think thats a kind of problem that would get fixed qucikly? Hm..
God Bless you all during the Christmas Octave! Beautiful pregnant tummy! Can't wait to see the sweet precious baby! Just heard this morning about the 10,000 Michigan families who have been without power this week. You would think that would be a bigger news story than people who order a present the day before Christmas and pout because they don't get it in time . ..
My husband told me it was 87,000 families. Crazy! And super cute belly, btw. You look great! I'm so sorry to hear about your power... at least it's back on now, though. Love the belly! Poking out - but still small - you look adorable! Glad you have power again. so happy you have power restored...so very happy for you all. I think you look fabulous. Loving that baby belly!! You look beautiful with that bump! We're still waiting on our power here. A neighbor just emailed me and said that a lineman told her it might be two weeks for our street. And right now I'm pretty sure that two weeks without power is going to kill me. I would not have survived in a time before electricity! My husband likes the idea of living a ruralish life. Then I read things like this and am SO thankful we live close to a city - power outages don't effect our water. Glad your life is getting back to normal! The fireplace. We camped out in the den. I'm betting no one will be forgetting that Christmas any time soon! I grew up in a wooded, rural part of Canada and sometimes we'll be without power for a day or two because trees fall on the lines and we're lower priority than town. My parents have a real wood stove, the kind you can cook & bake on, and I have fond memories of the rare times my mum actually had to cook on it because there was no alternative. As soon as the lights flicker she runs to fill up the bathtubs and sinks with water (for flushing toilets etc) and stores up jugs of drinking water. It's always very cozy. BUT it's Western Canada, so we don't get the freezing cold or ice storms, and my Gramma lives in town and always gets her power back first, so there's always a lit place to stay. So glad you had access to a generator! You had me at fart face... Glad you have the power back, Borobias! Dwija, what a lovely belly pic! You look just beautiful. A Christmas without poet sounds daunting! So glad you had a generator and working toilet on Christmas Day! You are KILLING me with that glorious belly. Ummmmm.... Yeah. No power? Or water? Or sanity? On Christmas? Maybe God thought He would give you a holy Bethlehem experience or something??? Dang girl. You went through all that but still manage to look gorgeous. You look beautiful with a baby in you. You look beautiful without a baby in you. You're just a beaut. I feel the same way about cooking during holiday/ vacation time. So glad your power is back on, and love the belly pict.! Here I am - a year late - hahahaha ok, sorry, lame joke! But you are so incredibly incredible belly awesome! Yay for babies! I think I've taken two belly shots - one for sure - annnnd I'm 25 (i think?) weeks along. Er mah...gotta get to picture takin' I guess!